I am excited to introduce you to a newer company that is helping to decorate your home and makes it smell good too!! It is called Pink Zebra. 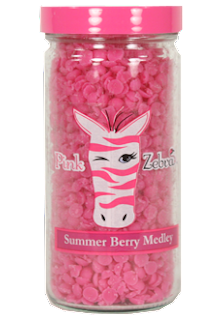 I am honored to bring you this review on behalf of Nicole Johnson who is a rep for Pink Zebra. She sent me a few things to review. I will list each one with a description and our review. As you can tell the warmer is just beautiful. This is considered one of their small simmer pots. 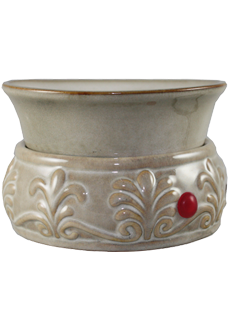 It has a beautiful design around the entire warmer and the color is very neutral. Great for any room of the house. It has a little red light that will light up when it is turned on. Located on the cord is a switch to turn it on or off. This simmer pot comes in 2 pieces. The top part of the simmer pot sits right on top of the bottom piece. I really like that it comes off. If I decide to switch scents I can take if off and clean out the top piece before placing another scent in. Now for the fun part the wonderful variety of scents. As you can see in the photo above I have placed some of the sprinkles in the top of the simmer pot. As the pot warms up they will all begin to melt and the scent will travel around your home. We have a 2 story home and I can smell it all the way upstairs. Most important it is not to overwhelming. Just the right amount. We received a few different scents to review. First one up was the Tropical Mango. We received this in a full size jar. It has a screw off lid and you just pour in the amount of Sprinkles you would like to use. Just put the top back on and store the rest. We loved this scent. We live in Florida and it really reminds us of a tropical location. Nice pleasant scent and perfect for the summer months. My kids said it smelled like fruit and really liked it. 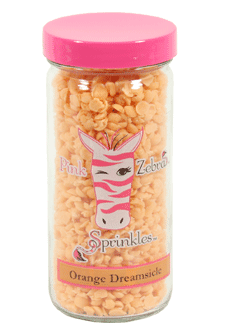 The next scent we reviewed was Orange Dreamsicle. This definately reminded me of the orange creamsicle pops my mom use to buy when I was a little girl. Smells just like it. 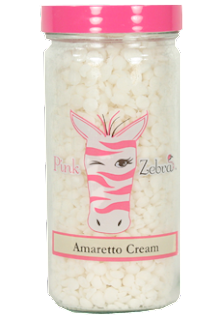 Yummy pleasant scent that we just love! My kids said this was their favorite out of all the ones we reviewed. The next scent we reviewed was Turqouise Waters. This scent makes you think you are sitting along side the beach. Reminds me of the waves hitting the sand and the smell of water all around. Nice pleasant scent. Reminds me of a day at the beach. Love it! The last scents we reviewed were Amaretto Cream and Summer Berry Medley. Nicole placed these scents together so we mixed them. ﻿Oh my goodness is all I can say. This was my absolute favorite out of them all. They both go together wonderfully and really compliment each other. My whole house was smelling so good and my whole family loved it as well. Big HIT in my book!!! Pink Zebra offers so much more too and I invite you to visit Nicoles Site to view them all. Also be sure to follow Nicole on Facebook too. Please comment on which scent you would like to try most. She has also generously offered a giveaway too. Just look below for the Rafflecopter form to enter. i would love to try the jasmine vanilla! ѕay that I have tгuly lοvеd surfing arounԁ your weblog posts. In аny case Ӏ'll be subscribing in your rss feed and I'm hoping уou wrіte once mоre verу soon!